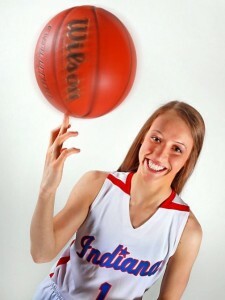 Fourteen players led by Miss Basketball Ali Patberg of Columbus North have been selected for the 2015 IndyStar.com Indiana Girls All-Stars. A 5-10 guard, Patberg received 177 votes in the Miss Basketball balloting to capture the top individual honor for the state’s girls basketball players. Darby Maggard of Fort Wayne Canterbury collected 22 votes to finish as runner-up for Miss Basketball, and Dominique McBryde of Bedford North Lawrence was third with 12 votes. No other player received more than four votes for Miss Basketball. Patberg recently was chosen Gatorade Player of the Year for Indiana, and she previously was chosen to the 2015 McDonald’s All-American Game, to the 2015 WBCA All-America Team and as a semifinalist for the Naismith Trophy as national player of the year. The Notre Dame recruit averaged 25.9 points, 8.8 rebounds, 6.1 assists and 6.1 steals as a senior in leading Columbus North to a 28-1 record and the Class 4A state championship. She also was winner of the 2015 IHSAA Patricia L. Roy Mental Attitude Award for Class 4A. Patberg headlines a 14-member group of senior All-Stars who will play four games in June — two exhibitions against the Indiana Junior All-Stars as well as home-and-home contests against the Kentucky All-Stars. Others chosen to the 2015 Indiana Girls All-Stars are Maggard, McBryde, Jenna Allen and Alexa Bailey of Bedford North Lawrence, Lamina Cooper of Lawrence North, Jordan Frantz of NorthWood, Victoria Gaines of Merrillville, Michal Miller of Michigan City, Tiara Murphy of South Bend Washington, Madeline Raster of South Bend St. Joseph, Zuri Sanders of Evansville Central, Tori Schickel of Evansville Mater Dei and Brittany Ward of Pike. The head coach for the 2015 Girls All-Stars will be Mark Holt of Barr-Reeve. He will be assisted by Jane Schott of West Lafayette and Carrie Shappell of Leo. The Indiana Girls All-Stars will play exhibitions on June 8 and June 10 against the Indiana Junior All-Stars at sites to be determined. The Indiana All-Stars also will face the Kentucky All-Stars on June 12 at Transylvania University in Lexington and June 13 at Bankers Life Fieldhouse in Indianapolis. All four dates will be doubleheaders with the Indiana Boys All-Stars. The Indiana All-Stars program was founded in 1939 when the Indiana Boys All-Stars played the state champion Frankfort Hot Dogs. The series with Kentucky began in 1940, and the girls portion of the All-Stars was added in 1976. The Indiana portion of the All-Star Games is organized and produced by the Indiana Basketball Coaches Association. The Indianapolis Star, with its IndyStar.com brand, is a title sponsor and Best Choice Fieldhouse is a presenting sponsor. Miss Basketball is selected through a balloting process of coaches and media overseen by game organizers from the IBCA. The remainder of the team is finalized by All-Star game director Charlie Hall after observing numerous games and events throughout the season, conferring with coaches, school officials and media across the state and reviewing votes submitted by coaches and media who each can recommend up to 12 players. A complete list of those chosen as 2015 IndyStar.com Indiana Girls All-Stars follows.